Turned out, "WWE SmackDown" was the perfect lead-in. "SmackDown," the pro wrestling show, aired Tuesday at 8 p.m. on the USA Network. 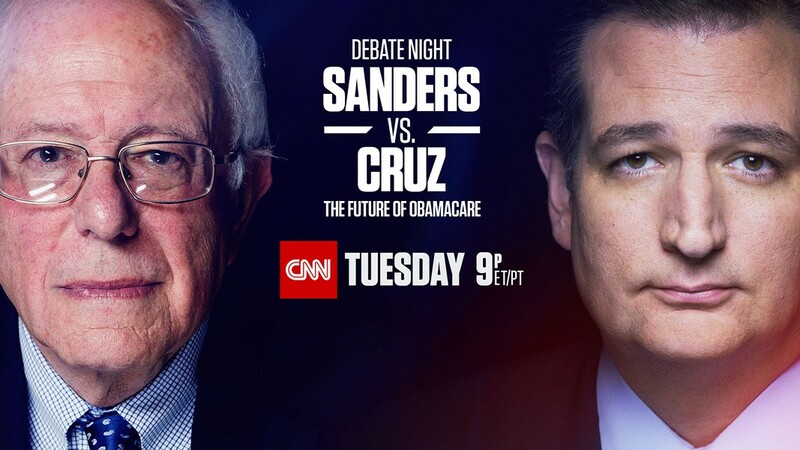 Then, at 9 p.m. on CNN, came the main event: Sen. Bernie Sanders (I-Vt.) and Sen. Ted Cruz (R-Texas) in a made-for-TV debate on the future of the Affordable Care Act. CNN’s promotional material even looked like a fight poster. The two protagonists in grim closeup, their names in stark bold print: “SANDERS vs. CRUZ.” Mano a mano! You can’t miss it! A pro wrestling match is a gymnastics routine in the guise of mortal combat. A good fight gives the impression of danger while preserving the safety of the combatants. And that’s pretty much what we got between the two senators on Tuesday: experienced, talented masters of their genre, showing off their moves and doing no real damage. Sanders and Cruz performed well. They’d obviously spent serious time preparing for the encounter. They played their respective roles to the hilt. They hit their marks, made their points and rarely exceeded their time limits. There was the occasional heated exchange — usually, conveniently, just before a commercial break. It all seemed so … scripted. Meanwhile, in the real world, Democrats in the U.S. Senate were continuing their spirited battle against the nomination of Sen. Jeff Sessions (R-Ala.) for attorney general. Sanders’ ally, Sen. Elizabeth Warren (D-Mass. ), was being officially silenced for daring to read a letter written by the late civil rights icon Coretta Scott King from the Senate floor. Sanders was also AWOL during the Democrats’ 24-hour floor protest against Betsy DeVos, nominee for education secretary. Sen. Patrick Leahy (D-Vt.) was among the speakers, but Sanders’ office confirmed that the junior senator was not. Ironic, considering that his political organization, Our Revolution, was putting out fundraising appeals tied to the Democratic caucus’ action. Lately, Sanders has been openly critical of the Democratic Party for playing “politics as usual.” At the same time, he’s made appearances on cable news and the Sunday talk shows, he’s penned an op-ed piece for the Washington Post, and he made time for that farce of a debate with Ted Cruz. Given Trump's dangerous and unconstitutional actions, the Democratic Party can no longer do politics "as usual." It all has the distinct stench of politics as usual. Honestly, we would love to know what Sanders means by “politics as usual” and how he differentiates his own actions from those of the Democrats. But we can’t tell you, because Sanders is unavailable for comment. Not to home-state media, anyway.